Schistosoma haematobium is an important digenetic trematode. 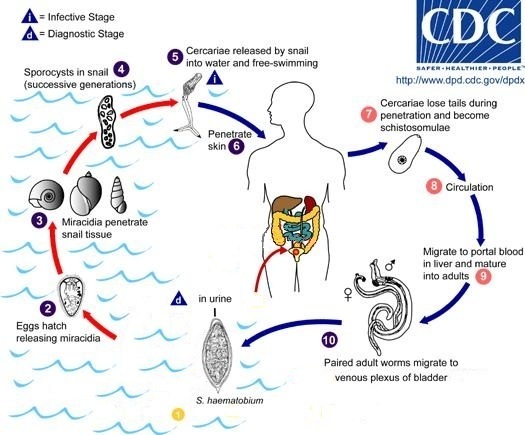 It is a major agent of schistosomiasis; more specifically, it is associated with urinary schistosomiasis. Eggs are eliminated with urine. Under optimal conditions the eggs hatch and release miracidia, which swim and penetrate specific snail intermediate hosts. The stages in the snail include 2 generations of sporocysts and the production of cercariae. Upon release from the snail, the infective cercariae swim, penetrate the skin of the human host, and shed their forked tail, becoming schistosomulae. The schistosomulae migrate through several tissues and stages to their residence in the veins. Adult worms in humans reside in the venous plexus of bladder . but it can also be found in the rectal venules. The females deposit eggs in the small venules of the portal and perivesical systems. The eggs are moved progressively toward the lumen of the bladder and ureters and are eliminated with urine. S. Haematobium is found in the Middle East, India, Portugal and Africa. A parasite-tumor linkage is further suggested by the predominance of squamous cell (as opposed to transitional cell) morphology of bladder carcinomas seen in S. haematobium-endemic areas, and by the frequent association of tumors with parasite ova and egg-induced granulomatous pathology in involved bladder tissues. Pathology of S. haematobium schistosomiasis includes: hematuria, scarring, calcification and occasional embolic egg granulomas in brain or spinal cord. Studies have shown the relationship between S. haematobium infection and the development of squamous cell carcinoma of the bladder. Fibrosis induced by schistosome eggs may induce proliferation, hyperplasia and metaplasia, all of which are possible precancerous changes. Chronic urinary bacterial infection and production of nitrosamines from their precursors in urine, that are well known bladder carcinogens. Urinary stasis allowing concentration of endogenous carcinogens leading to their absorption from urine and exposure of the bladder epithelium. Raised urinary beta-glucuronidase levels originating from miracidia and adult schistosomes liberating carcinogenic amines in urine. Through the effects observed in Sh(S. Haematobium total antigen)-treated cells, Sh is likely to participate in a number of carcinogenesis mediated processes, such as increased cell proliferation and loss of p27 (cyclin dependent kinase inhibitor), decreased apoptosis and increased expression of Bcl-2 (an anti-apoptotic protein).The effects of Sh on the cell cycle may contribute to the high proliferation rate and accumulation of genetic changes during schistosomiasis associated tumorigenesis. Moreover, studies with Matrigel to mimic basement membrane show that Sh increases migration and invasion, suggesting a role for it in later stages of bladder carcinogenesis. Intravesical instillation of Sh in CD-1 mice normal bladder induces the development of urothelial dysplasia and inflammation. Gene mutations were investigated in these bladders. Twenty percent of the dysplastic bladders presented a mutation in Kras gene. The presence of this mutation could have one of two explanations: either the parasite total antigen has carcinogenic molecule(s) sufficiently genotoxic and causes direct attack on the ras gene leading to uncontrolled proliferation of the cells, causing dysplasia; or the parasite antigens are only mitogenic for the urothelial cells causing increased proliferation. It is known that schistosomes have estradiol receptors and in all of infected patients serum levels of estradiol are significantly elevated in comparison with non-infected controls. Recent experimental evidence suggests that schistosomes can exploit the hormonal microenvironment within the host to favor their establishment, growth and reproduction, throght the espression of a estradiol-related proteins. These molecules show a putative binding affinity with ER and they probably are able to antagonize estradiol activity and downregulate ER. Estradiol has been shown to increase the smooth muscle density of the bladder in female, the down-regolation of ER leads to a thinner smooth-muscol layer in the bladder mucosa and this could possibly increase the number of eggs released. Nevertheless these estradiol-related proteins might be formed by reactions of estrogen-quinones with DNA. The quinone forms generated by metabolic activation of catechol estrogens are highly electrophilic species. Some authors reported that these species are able to covalently bind DNA bases, forming stable adduct. The carcinogenic effect of this estrogen adduct-mediated pathway of the estrogenic molecules present in S. haematobium extracts could explain the link between this parasite and squamous cell carcinoma of the bladder. Recent studies on inflammation-related carcinogenesis suggest that inflammation by S. haematobium infection may increase the number of mutant stem cells, in which iNOS-dependent DNA damage occurs via NF-κB activation, leading to tumor development. Microscopic identification of eggs in urine is the most practical method for diagnosis. Eggs can be found in the urine in infections with S. haematobium (recommended time for collection: between noon and 3 PM). Detection will be enhanced by centrifugation and examination of the sediment. Quantification is possible by using filtration through a Nucleopore® membrane of a standard volume of urine followed by egg counts on the membrane. Bladder biopsy may demonstrate eggs when urine examination is negative. Antibodies detection can be useful in both in clinical management (e.g., recent infections) and for epidemiologic surveys. Safe and effective drugs are available for the treatment of schistosomiasis. The drug of choice is praziquantel for infections caused by all Schistosoma species. Both epidemiological evidence and scientific results indicate that S. haematobium is associated to squamous cell carcinoma of the bladder, through inflammation and carcinogenic pathways.